During the early 1960s, Bowie was performing either under his own name or the stage name "Davie Jones", and briefly even as "Davy Jones", creating confusion with Davy Jones of The Monkees. To avoid this, in 1966 he chose "Bowie" for his stage name, after the Alamo hero Jim Bowie and his famous Bowie knife. 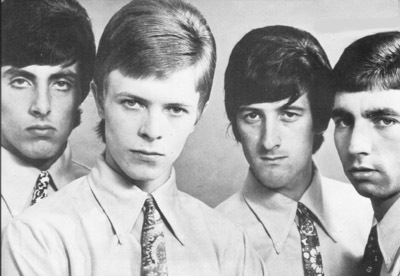 During this time, he recorded singles for Parlophone under the name of The Manish Boys and Davy Jones and for Pye under the name David Bowie (and The Lower Third), all without success.